If you like candles, jewelry and surprises this post is for you. 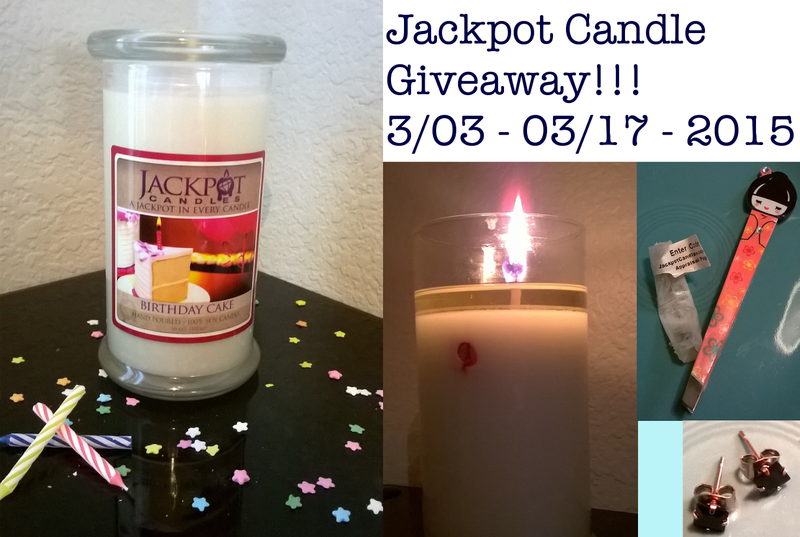 Recently I had the opportunity to review a beautiful candle from Jackpot Candles. I also received one to giveaway - yay! Jackpot Candles are soy based surprise candles. Each high quality candle has a foil package embedded in it containing a piece of jewelry with a retail value of $5-$5,000. It's a pretty sweet deal. What makes Jackpot Candles Special? Jackpot Candles give the purchaser the unique option of being able to order a candle in a specific ring size, unlike other brands of surprise jewelry candles such as Diamond Candles which I have mentioned here. Jackpot Candles also give you the option of choosing earrings or a necklace instead of a ring which I really appreciate. My candle had an E written on the bottom of it to indicate that it was an earring candle and the giveaway candle has an N on the bottom because it has a necklace inside. This candle will last a long time. I burned my candle for 8 hours straight before I felt as though the wax was low enough to grab the foil without damaging the candle. The wax was very soft but still white. If I would have waited about 3 or 4 more hours it probably would have been perfect. Since my foil pouch was still halfway lodged in white, unmelted wax it took a slight tug to remove my earrings but they came out easily and the clear wax on top settled inside the divot. I would recommend being more patient as I was lucky to have the wax resettle so nicely. Thankfully it has not affected the burn. When the glass lid is removed the Birthday Cake candle smells wonderful even before I light it. Sugary scented candles are among my favorites so I had a feeling that I would love it. The candle's scent is strong enough to fill a small room. I would rate it's strength as medium/high compared to other candles that I have burned. I have found that most soy candles are not quite as strong as high quality paraffin candles. I'm guessing that it has something to due to with the lower melting point of the wax. Jackpot candles are strong, just not quite as powerful as Yankee or Goose Creek candles. Although I love the far reaching scent throw of paraffin candles like Yankee and Goosecreek they are not so great for the environment. Paraffin waxes are actually a byproduct of petroleum that can leave allergens and soot in the air when burnt. Unlike paraffin soy is environmentally friendly because it is easily sustainable and it doesn't produce black smoke. The glass containers used for Jackpot Candles are a nice size for a vase. I think they would also make cute containers for a candy bar! The soy burns so cleanly that it is not too difficult to remove all of the wax residue. The sticker on the glass peels off nicely so that there is no residue behind. When I retrieved the package I found an appraisal code in the pouch with my earrings. Once I entered my code in the Appraise form online I found that the value of my earrings is $17. They are not sterling silver but I think that they may be stainless since they haven't bothered my sensitive ears yet. I don't think I would pay $17 for them because I usually buy only gold or silver jewelry and I rarely pay retail value. Since I wait for steep discounts before I buy jewelry, I probably wouldn't pay more than $10 for them myself. Even thought the RTV of the earrings is pretty low I like them. I needed a new pair of studs and I like the grey/black color of the stones. It would be nice to know if the stone is actual stone or glass. I know that it would take more time for Jackpot Candle's employees to list the identity of the stones in each piece of jewelry that they ship out but I think it would be a nice touch if the information was released along with the appraisal value. I like reading up about the properties of the colors and stones that I wear. I really enjoy my Jackpot Candle. The scent is pleasant and it was fun to discover what surprise was hiding in the candle. My whole family was excited for the big reveal! My hands smelled like birthday cake for the rest of the day after I retrieved my earrings, nom. 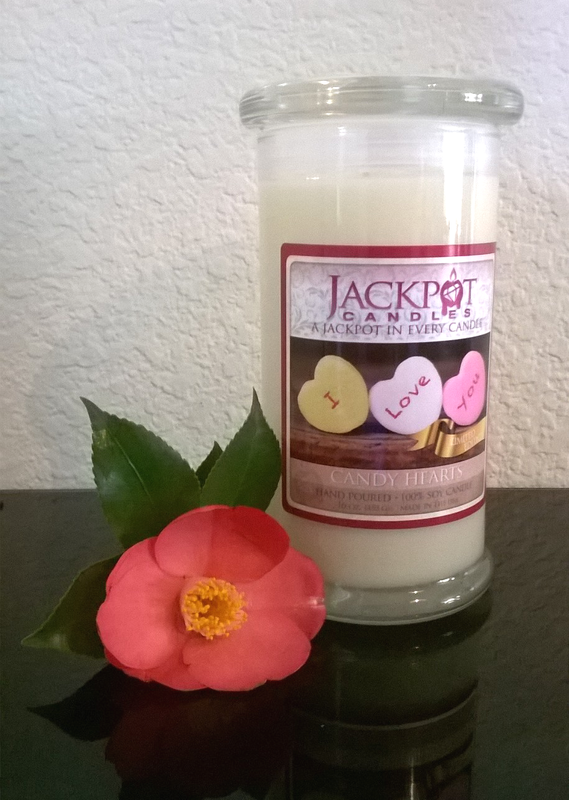 I have a beautiful Candy Hearts candle which I will be giving away via Rafflecopter. The scent is divine. The Jackpot Candles website describes it as, "tones of vanilla and sugar with subtle hints of cinnamon." There is a necklace hidden inside of it worth anywhere from $5-$5,000. This raffle will last 2 weeks. It starts today 03/03/15 and ends on St. Patricks Day 03/17/15. You must live in the United States to participate in the raffle since this is a fragile item. Please enter the giveaway through the Rafflecopter form below. The winner will be contacted using the email provided to Rafflecopter. Any personal information will be used only to ship the candle. Wishing you all warm rays of love and inspiration! ****Disclaimer - A sample of this product was received for review. All opinions are my own. The Birthday Cake candle sounds interesting. Omg, Yankee's Balsam & Cedar is one of my favorite scents. Think I'm going to have to light one now :). I like vanilla or fruity scented candles. No I haven't had prize candles before but like ring size 7 or necklaces. Cash would be good too lol. I tend to like candles that smell like I've been baking yummy treats, so this Candy Heart candle with vanilla and cinnamon scents sounds perfect! I've never had a surprise candle before, but I'd like one for sure (especially earrings). I love citrus scents. I have had candles with jewelry inside - so much fun. Oh I would love the Cherry Blast! I love that smell!!! I would love to find a ring inside! I would like to find a solid gold nugget in my candle! Now that sounds like my kind of candle :). Ive never tried suprise candles but I think its an amazing idea. I want to find the big $$ one!. I like the banana nut bread and cucumber melon scent. I have Goose Creek's Spun Sugar in my warmer right now - nom! I have not tried this before. I would like the Cinnamon Sensation Jewelry Candle scent. My favorite candle scents is Honey Dew Melon. I buy them all the time. I have not purchased a surprise candle before. I may have to try that. I have yet to try a Honeydew scent, sounds divine! I adore Vanilla or any type of fruit!!! I have always wanted to try a surprise candle! Good luck everyone! I would like outdoor woodsy scents. I would love to find my prince charming in the candle. My best friend and I have birthdays 1 day apart also 3/16 for her and 3/17 for me. We are going to the casino on my birthday. Also I have never tried a surprise candle. So crazy that you and your best friend are also born a day apart, its such an awesome bond! My favorite scent is for candles i cherry. I have not tried one of these candles yet and i would love to find a diamond ring in one but i'm sure eveyone would. My favorite scent is cucumber melon! I would love to fins ear rings in my candle. I've never tried a candle like this before. I hope I win so I can!!! I like the summer scents such as ocean or beach scents. My favorite candle scent is lilacs. It reminds my of my grandmother who had many bushes in her yard! I prefer spring/flower scented candles like lilac or lavander. My husband bought me a prize candle--don't remember which one exactly--and I got a pretty little citrine ring from it. I love lilac scent and anything freeze smelling. I love jewelry candles. I have never tried these types of candles but I want to try the Birthday Cake one!! I have never tried a surprise candle. I love citrus and vanilla smells. Thank you for entering everyone, hopefully we will have more giveaways in the near future :). Congrats Paula! why this candles so popular? I celebrated my 18th birthday with help online games. It was unforgettable.I want to share some secrets how big win.https://casinority.com/how-to-win-at-the-casino-real-big/ You will be very surprised. Last year in Las Vegas was unforgettable.I was a real lucky!